If you’ve been using and creating Animoji on iPhone and sharing them with other people, you may have noticed that Animoji are saved and shared as video files in the .mov file format. But Animated GIF files are exceptionally popular, as they loop endlessly on any device or operating system they are received on, and plus animated GIF files can be easily posted and shared on the web and other social services. Thus you might be interested in converting Animoji into GIF format, which you can do directly on iPhone. 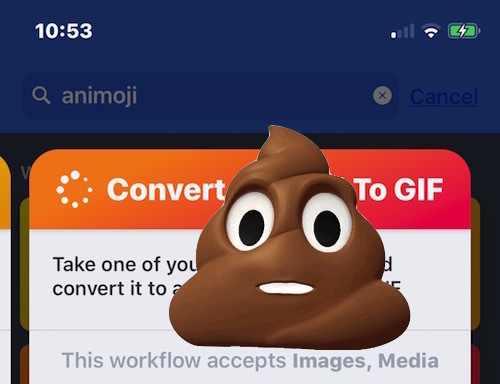 We’re going to focus on using a free iOS app called Shortcuts (Workflow) to convert the Animoji into GIF, because once the initial setup is complete it becomes quite easy to re-use. If you don’t want to use Shortcuts / Workflow for whatever reason, then you can use another app to get the job done, as long as it converts video to animated GIF directly on iPhone, like GIF Mill. This tutorial focuses on using Shortcuts/Workflow, however. Note: Apple bought Workflow and changed the name to Shortcuts, thus the app names are used interchangeably for backwards compatibility. Newer versions are named Shortcuts, however. In case you were wondering, there is no native iOS ability to directly save Animoji as GIF animations. Oddly enough Apple has not included functionality to turn Animoji to GIF, so instead you will have to manually convert the Animoji into GIF on each occasion that you wish to have an Animoji saved and sharable as an animated GIF image file. This means using Shortcuts / Workflow each time, but once you have the initial setup of the Shortcuts / Workflow done the repeat process is really easy. This walkthrough assumes you already know how to use Animoji on iPhone, if not you can go here to learn how that works. The setup and multi-step process of using Shortcuts / Workflow may look off-putting and complex, but it’s really not that difficult, so just follow along and you’ll have animated Animoji saved and converted as animated GIF files in no time. Yes this works to convert a Memoji to GIF too. You can tap to open the animated gif in Photos app, or share it, or do whatever you want with it. Phew! 15 steps or so to convert an animoji to GIF! It looks more complex than it is, really. Hopefully a future version of iOS will just have an easy option to “Save Animoji as GIF” or something similar so that the cumbersome process of downloading another app and using Shortcuts / Workflow is no longer necessary. On a quick side note, Shortcuts / Workflow is an interesting app that is sort of like a limited version of Automator for iOS. It was a third party app, and then Apple bought Shortcuts / Workflow, so now it’s part of the official Apple application list for iOS devices. It’s worth keeping around as it can preform a lot of automated functions, conversions, posts, and other interesting tricks that can help more advanced iOS users with certain tasks and repetitive actions. Also once you have created your Animoji to GIF Shortcut / Workflow, then you can save it to your Home screen, or as a widget, to quickly summon the animoji to GIF action at any time without repeating the above steps. By the way, Mac users can also convert Animoji to GIF if the Animoji video file is sent to them via Messages, Email, or saved to iCloud Drive. On the Mac, the Animoji movie file can be converted to GIF easily with Drop To GIF or Gif Brewery. Similarly, iPhone users can also rely on other apps that to convert videos to gif files, if you have used one for converting a Live Photo to animated GIF for example, such an app should work for converting saved Animoji to GIF as well. It’s also possible that eventually Animoji as GIF files will end up in the searchable GIF database in Messages app on iOS, but of course those wouldn’t be custom Animoji. Anyway, enjoy your animated GIF Animoji! What is the professional or business use case for Animoji? Does anyone know? I am surprised Apple has not made it easier to create animated GIF directly in iOS. For both Animoji, and for Live Photos. Saving as a movie is odd to me, whereas GIF is universal supported. Perhaps it is a lock-in method. For best experience, you and recipients must use Apple products. Therefore you must buy Apple products? I don’t know. But then gain, I don’t see the purpose of Animoji anyway as I am not a teenager. When I tap on the Emoji in the messages app, it does not give me the option to SAVE. it says Copy, Speak, and MORE…. Animoji requires iPhone X or newer, it is different from Emoji. Animoji are animated Emoji, whereas Emoji are just little static icons. You can just send Emoji around like normal. Maybe it’s time to upgrade to iOS 11, then. The Save option shows up on an animoji in the Messages app when I touch and hold on an iPhone 5s. You can’t currently create an animoji on anything but an iPhone X, but once created, it’s just a short video clip. So if someone has texted you with an animoji, you can create a GIF from it with the appropriate video->GIF app, or the procedure outlined above. OR – or, we can not use animoji at all and still live in peace.